Mt Kenya the second highest Mountain in Africa and our favourite. The highest peaks of the mountain are Batian (5,199 m - 17,058 ft), Nelion (5,188 m - 17,022 ft) and Lenana (4,985 m - 16,355 ft). 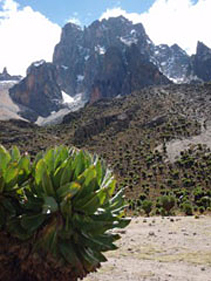 Mount Kenya is located in central Kenya, just south of the equator. Batian and Nelion require advanced climbing skills whilst Lenana is accessible to any healthy walker. This expedition is to the true summit Batian 5,199m via Nelion 5,188 m so you'll need to have experience of seconding VS (5.8). If you don't already posses the required experience contact us to arrange tailored training. This expedition is led by an experienced and qualified leader. With a leader to client ratio not exceeding 1:2. Day 1: Arrive in Nairobi, Spend the night in a hotel. Day 3: Having caught up on our sleep we will drive from Nairobi to Naromoru Town, where we will meet our porter crew and drive for a further hour to Naro-moru Gate (2,400m). Once we have registered at the National Park gates we will take a 4hr, 10km walk to the Met Station (3,040m) and camp overnight. Day 4: After breakfast we will strike camp, keeping an eye out for the monkeys who are entertained by stealing anything outside your tent. Our trek starts though boggy moorland but soon to joins the Teleki Valley, where we get our first views of the multiple tops of Mount Kenya. After another two hours we arrive at Mackinders Camp (4,300m), where we stay overnight. Day 5: Today we explore the area around Mackinders with a short walk to the Western Circuit, where we can enjoy views of the Diamond Couloir, which was once one of the most sought after ice routes in the world, but is now sadly depleted of ice. We will return to Mackinders Camp for lunch and spend the afternoon relaxing and planning our climbs. Day 6: After breakfast we trek to the Austrian Hut (4,790m), passing one of our objectives - Point John - en route. Arriving at the hut for lunch leaves us plenty of time to trek to Point Lenana and to improve our acclimatisation. Day 7: Today we will explore the route across onto the Lewis Glacier and on to the start of our route on the South East Face. As the lower part of the descent may have to be completed in the dark, it's a good idea to be familiar with this lower section of the route. We will climb a few pitches to 'Baillie's bivi' and stash some food/water/fuel/stove for tomorrow. Day 8: We will have a very early start and get to the bottom of the route as the sun rises. The first few pitches are relatively easy if the rock is dry, but prove to be more difficult if covered in ice. We then traverse to the 'Rabbit Hole', which we struggle through to reach the upper chimneys. The De Graafs variation is the crux of the route. Easier climbing allows us to reach the half way hut, where we cross over the ridge to reach the Mackinders Chimney. In the dry, the Mackinders Chimney is straightforward, but in the wet it proves to be vey interesting. Once up this we climb another two pitches and make a traverse to a gully. There is some loose rock that we need to take extra care of, but the route is straightforward until we reach the short chimney, which is surmounted. From here two shorter pitches lead us to the top, where we can get a well-earned brew at the Howell's Hut. The hut only accomodates four people, so if it's full we may have to bivi outside. Day 9: If the weather permits and we have carried the essential equipment, we can make a traverse across the Gates of Mist to Batian. Typically, it involves some abseiling and Scottish Grade II snow and ice. This traverse should not be underestimated and could easily take all day in bad conditions. On our return to Neilion (5,188m) we can abseil down the to the bottom of the route and make our way back to the Austrian Hut. Expect this to be a very long (14 hour) day, as previous teams have arrived back at around 5pm. Day 10: Spare day if needed. A very strong/fast party could climb the route and return to the Austrian Hut in a day. Day 11: We leave the Austrian Hut and descend the Sirimon Route, passing Shipton's Camp (4,250m) and continue to Old Moses' Camp, where we will stay overnight. Day 12: After breakfast we can walk leisurely down through the rainy forest to the Sirimon Gate (2,650m), where we will be met by our transport and visit Nanyuki Town for Lunch. After lunch we can continue our drive to Nairobi. Day 13: Early morning departure from Nairobi, arriving home the same evening. £6,000 for 2 people exc. flights. Mount Kenya is a member of the second seven summits and Volcanic second seven summits. We regularly run expeditions to Ojos del Salado another mountain on the second seven summits list.